The Kumsong-3 is a variant of the Russian-made cruise missiles: the KH-35 and KH-35U. Originally designed in 1983 by the Soviet Union, the North Korean variant more closely resembles the KH35U which Russia deployed in 2003. The Kumsong-3 travels at subsonic speeds and uses inertial guidance, however, there are indications that the design and possibly the guidance system of the Kumsong-3 differs from its Russian counterparts. Photographic analysis has suggested that the Kumsong-3’s booster and separation design differ as well as the body length and it is possible that the Kumsong-3 adds an infrared terminal seeker. It is unclear how North Korea acquired the Kumsong-3. Reports suggest that it could have been acquired directly from Russia or indirectly via Myanmar. 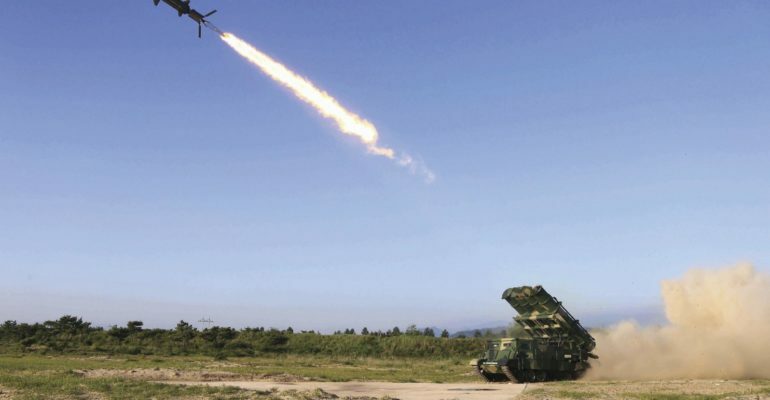 The exact capabilities of the Kumsong-3 are still not known, however, based on its variants, the KH-35 and KH-35U, it can be assumed that the Kumsong-3 will greatly add to North Korea’s Anti-Access/Area-Denial capabilities. Analysts have estimated that the payload on the Kumsong-3 has the capability to take out an American aircraft carrier. This significant improvement to North Korean missile technology, along with the most recent tests of the missile, compounds the threat to the United States and its allies operating in the Asia-Pacific region.